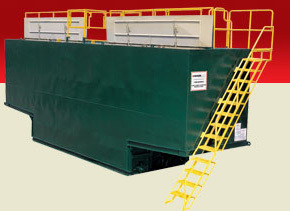 Ideal Usage for EZ Access Tank: Excess water in construction and environmental runoff projects. Spent acids, caustics, viscous or turbid liquids. Excess water in construction and environmental runoff projects. Spent acids, caustics, viscous or turbid liquids. Torsion spring lid for one-man operation. Easy clean-out. RCRA certified. Safe access and work area. Open top convenience with closed top security. Height - Standard: 12' 6"; Short: 11' 10" (grade to roof deck) Note: Handrails are above roof deck level. Quality/Safety Features - QMS inspections on a scheduled basis. Stairway; guardrails around top deck.